An easy to grow and wonderful smelling plant, lemon balm has many healing applications and medicinal uses. If you grow your own herbs and plants to use for cooking and healing, then lemon balm is one plant you must have in your growing herb garden. You can cook with it, perfume with it, and heal with it. So, what’s not to love? Native to southern Europe and the Mediterranean, but now found growing in the wild across the globe, lemon balm (Melissa officinalis) is a member of the mint family (like oregano, thyme, and peppermint, of course). Though while the leaves are shaped similarly to others in the mint family, slightly thickened with deep veins, one thing that sets lemon balm apart is its scent. The herb has a sweet lemony smell, which likely made the plant all the more popular over the years. In the 17th century, a concoction known as Carmelite Water, produced by the French Carmelite nuns, contained lemon balm and was used as a “miracle water” for improving memory, reducing pain, encouraging digestive health, and improving mood, among other things. It’s also been used over the centuries as a wound healer and relaxation-promoter. In gardens, it’s always been known as a great way to attract pollinators. As with most plants in the mint family, Melissa officinalis has a wealth of health benefits. Bruise the plant with your fingers and you can smell the oils credited with many of these healing properties. It’s antiviral and anxiolytic properties are of particular note. As mentioned, lemon balm has always been recognized as a relaxation aid and used to ease insomnia and anxiety. Modern studies have affirmed this age-old use and found that particularly when used in conjunction with other relaxing herbs, like Valerian, it shows promise as an anxiety treatment. Italian researchers found that lemon balm’s antiviral properties make it a great topical treatment for Herpes simplex virus type 2 (cold sores). Their study suggested the herb doesn’t stop the virus from entering the cells but fights it once it invades. This, they say, justifies the need for future clinical trials on the plant’s antiviral benefits. There may even be a promising future for lemon balm in the treatment of Alzheimer’s disease. Published in the Journal of Neurology, Neurosurgery, and Psychiatry, researchers found that using a lemon balm extract over a period of 4 months showed a significantly better outcome than a placebo in boosting cognitive performance. The extract both improved cognitive function and reduced agitation that is normal in Alzheimer’s patients. Of course there are other potential medicinal uses of lemon balm that should not be ignored. 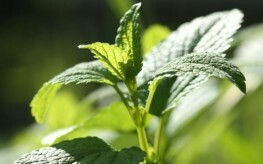 Remember, lemon balm is a mint, so like others within the mint family it can and will grow above and beyond. For this reason, it makes a great container plant. You can usually find small plants at a local greenhouse. Or, you can start it from seed. Make sure you wait until the danger of frost has passed, however, as lemon balm prefers warmer temperatures. It needs full to partial sun to thrive. If you live in a particularly warm climate, it can cope with more afternoon shade than if you are further north. Trimming it back occasionally will help encourage new growth and a fuller, healthier plant. You can harvest when you prune or anytime you want some of the leaves. Like mint, cut the stems back close to the base of the plant. The fragrance and flavor are best from the fresh leaves rather than dried. So use it fresh throughout the summer before drying what’s left just prior to cold temperatures hitting. Lemon balm is most often taken internally through a tea or a tincture. Teas are easiest and involve using 2 teaspoons of fresh leaves (or 1 teaspoon of dried) per cup of water. Allow to steep for 5 minutes before using. Tinctures are for the slightly more advanced herbalists, but shouldn’t scare a novice off. For a tincture, you cover the fresh herbs with vodka packed into a canning jar and allow it to sit for about four weeks. Strain the herbs off after this period and store your tincture in a dropper bottle or small mason jar, taking drops when you need it. Because the vapors of lemon balm are similarly soothing, consider making your bathtub into a giant tea. But don’t sip the bathwater while you soak. I thought the extremely cold dutch winter had killed my plant, which i had for decades. Little was left of it. Then i discovered a plant in my frontgarden, where it apparently had decided to spontaneously seed itself. Can you post recipes for lemon balm?